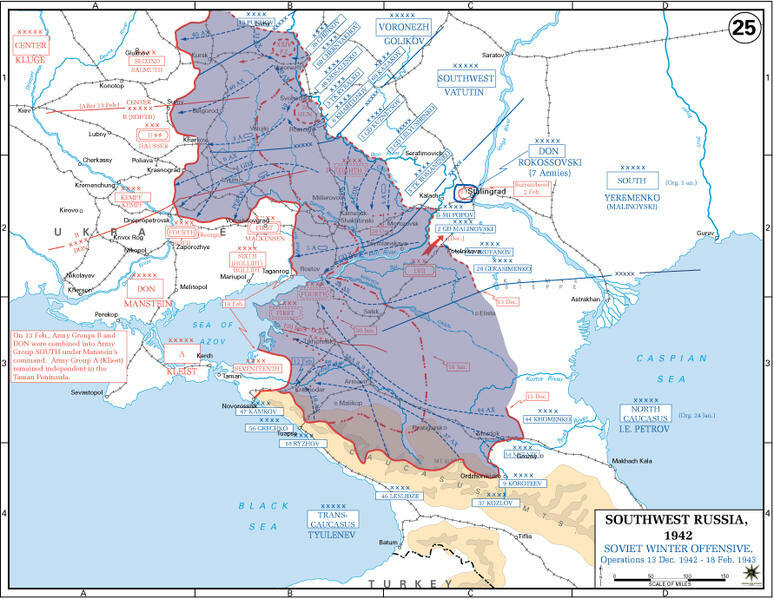 Operation Saturn, revised as Operation Little Saturn, was a Red Army operation on the Eastern Front of World War II that led to battles in the northern Caucasus and Donets Basin regions of the Soviet Union from December 1942 to February 1943. The success of Operation Uranus, launched on 19 November 1942, had trapped 200,000 - 250,000 troops of General Friedrich Paulus's German 6th Army and 4th Panzer Army in Stalingrad. To exploit this victory, the Soviet general staff planned a winter campaign of continuous and highly ambitious offensive operations, codenamed "Saturn". Soviet forces consolidated their positions around Stalingrad, and fierce fighting to shrink the pocket began. Operation Winter Storm (Operation Wintergewitter), a German attempt lead by Manstein to relieve the trapped army from the south, was successfully fended off by the Soviets in December. The full impact of the harsh Russian winter set in. The Volga froze solid, allowing the Soviets to supply their forces more easily. The trapped Germans rapidly ran out of heating fuel and medical supplies, and thousands started to die of frostbite, malnutrition, and disease. On 16 December, the Soviets launched a second offensive, Operation Little Saturn, which attempted to punch through the Axis army on the Don and take Rostov. If successful, this offensive would have trapped the remainder of Army Group South, ⅓ of the entire German army in Russia, in the Caucasus. The Germans set up a "mobile defense" in which small units were to hold towns until supporting armor could arrive. From the Soviet bridgehead at Mamon, 15 divisions—supported by at least 100 tanks—attacked the Italian Cosseria and Ravenna Divisions, and although outnumbered 9 to 1, the Italians resisted until 19 December, when ARMIR headquarters finally ordered the battered divisions to withdraw. The Soviets never got close to Rostov, but the fighting forced von Manstein to extract Army Group A from the Caucasus and re-establish the frontline some 250 km (160 mi) away from the city. The Tatsinskaya Raid also caused significant losses to the Luftwaffe's transport fleet. The 6th Army now was beyond all hope of German reinforcement. The German troops in Stalingrad were not told this, however, and continued to believe that reinforcements were on their way. Some German officers requested that Paulus defy Hitler’s orders to stand fast and instead attempt to break out of the Stalingrad pocket. Paulus refused, as he abhorred the thought of disobeying orders. Also, while a motorised breakout might have been possible in the first few weeks, the 6th Army now had insufficient fuel and the German soldiers would have faced great difficulty breaking through the Soviet lines on foot in harsh winter conditions.